Venezuela was rocked this past Saturday by an attempted assassination of President Nicolás Maduro, during a public event, using drones armed with explosives. But as more details started to become available, the coverage of the mainstream media actually moved in the opposite direction: one after the other they have looked to sow doubt on the events, using words such as “apparent” or “alleged”, focusing instead on the government using this “alleged” event to step up repression. In the end, it is hard to tell apart the media coverage from the statements of John Bolton, one of the more hawkish advisers to the US president. 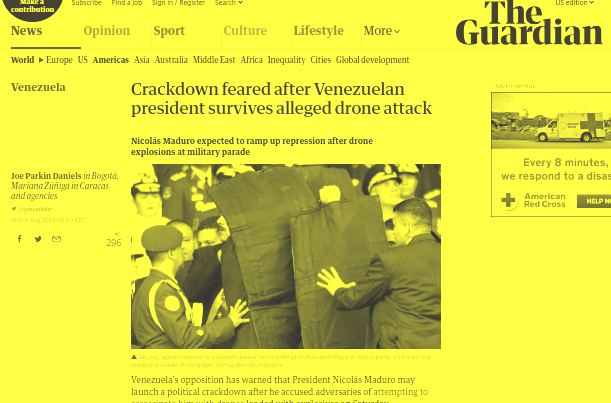 The Venezuelan opposition, in their newly-minted Frente Amplio coalition, which is sure to have its fingerprints all over this, can count on The Guardian as a megaphone to accuse the government of “making “irresponsible” accusations without any proof” and preemptively denounce upcoming repression. Nevermind the fact that opposition leaders have repeatedlybeen involved in violent attempts to overthrow the government. Also, just a few tweets later, one of the parties in the Frente Amplio, Primero Justicia, threatened Maduro with actions “like this one or worse”. Following that we are told that “No one has claimed responsibility for the alleged assassination attempt”, although the group Soldados de Franelas, whose members are unknown, claimed this attempt as a victory, and later published a statement on a so-called Operation Fenix, read by notorious anti-government journalist Patricia Poleo in Miami (2). The statement affirms that it is the duty of the armed forces to remove the current government which, among other things, is guilty of indoctrinating children with communism! Then we are treated to two paragraphs replete with distortions. There is a mention of the economic crisis, which is fair enough but referring to an IMF prediction which is utter nonsense. Next we read that Maduro “replaced” Chávez (he was elected), that he repressed anti-government demonstrations left 100 dead (opposition violence was responsible for a large part of the casualties), and that he sidelined the opposition-led congress (they are in contempt of court) by installing (there were elections, 8M+ voted) a body stacked with loyalists (again, there were elections and 6.120 candidates ran for 545 seats). All in all, it seems like the US Empire, its allies and the stenographers in the mainstream media are trying to play a game in which they never lose. They constantly call for a coup, even report on foiled attempts, (4) but when something actually takes place, the reaction is along the lines of “the US/Colombia/Venezuelan opposition had nothing to do with this coup/assassination attempt which maybe did not even happen”. Had it succeeded, as the 2002 coup did briefly, they would be celebrating “a victory for freedom”. Since it failed, it was all in the dictator’s imagination! But the crackdown is certain, which will then justify people wanting to kill Maduro or attempt a coup, and the cycle starts again. (1) This is in stark contrast to two recent episodes. An anti-Assad filmmaker and an anti-Putin journalist faked an assassination attempt and their own death, respectively. Both were immediately reported as absolute certainties, even though the details were fishy, only to be revealed within hours to be publicity stunts. (2) Patricia Poleo has been formally accused of being involved in the assassination of Danilo Anderson in 2004. Like Posada Carriles and plenty of other terrorists, she found safe haven in Miami. (3) Pérez was aboard the loony train that claims that the Cubans are running the show in Venezuela. Patricia Poleo’s statement also hinted at this, and opposition leaders have also run with this time and again. Yet this gets filtered out because these characters need to remain credible. (4) Donald Trump has gone so far as to raise the possibility of a US invasion, repeatedly, in public.